This article appeared in The Onion, and like all good satire it contains more than a germ of truth. Why design more chairs when there are already so many different types available? Do we really need new chairs? It’s not as if the old models have become obsolete. Although I don’t powder my hair or wear buckled shoes, as the Founding Fathers did, I regularly sit on a Windsor chair, and my favorite wing chair is a replica of a mid-18th-century design. My neighborhood bar is furnished with beat-up bentwood chairs—stools, side chairs, and upholstered No. A811Fs—which function perfectly well although their design is older than I am. All true, yet the history of the chair is a continuing chronicle of searching for new ways to sit and new furniture to sit on. Why? First, chairs are affected by changes in technology and materials. The invention of upholstery in the 18th century changed the appearance of chairs and produced entirely new types: fauteuils, bergères, sofas. Steam-bending produced the Windsor chair and the bentwood chair. New materials such as tubular steel led to springy cantilever chairs; plywood and fiberglass allowed designers to conceive chair seats that were one-piece shells. 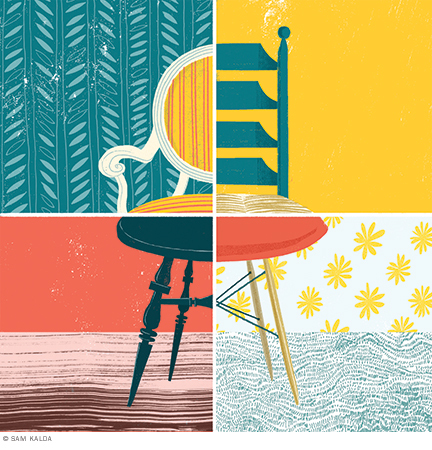 Technical innovation was sometimes spurred by a search for economy, sometimes by a desire to discover a new solution to an old problem, and often chair makers were simply along for the ride, exploiting technological advances in other fields. Like all modern artifacts, chairs reflect the shift from handwork to industrial production, meaning that as old techniques disappeared new ones were found to replace them: bentwood instead of carved wood, tubular steel instead of bentwood, shaped plywood instead of tubular steel, and plastic instead of plywood. Chairs are also affected by posture. It is a chicken-or-egg question, but on the whole I think posture usually comes first. The way we choose to sit is conditioned by culture, not by anatomy, and can change suddenly and unpredictably. How else to explain the emergence of the klismos in Greece in the 5th century BCE , the advent of chair-sitting in Song dynasty China, the enthusiasm for rocking chairs in 19th-century America, or the popularity of chaises longues among 20th-century modernists? What is certain is that when posture changes, the old chair no longer serves and a new one is needed. Conversely, if posture remains constant, the old models tend to endure. This may explain the longevity of the wing chair. Lastly, chairs can be powerful symbols. In North American universities, departments are led—chaired—by chairpersons, endowed professorships are called chairs, and in many institutions retiring faculty are honored with an actual chair—usually a captain’s chair or a Boston rocker, with the university seal on the crest rail. The link between scholars and chairs originated in the ancient Islamic world. Caliphs appointed leading scholars to “chairs” in universities or madrassas, the position so named because professors occupied chairs whereas students sat on the floor. The earliest symbolic chairs were those reserved for royal, imperial, or religious leaders: St. Edward’s coronation chair in Westminster Abbey, the Dragon Throne of the Chinese emperors, the Peacock Throne of the Persian shahs, the Chair of St. Peter in the Vatican. The identification of the occupant with the chair of state was so complete that we still speak of “ascending the throne” or “usurping the throne.” The regal throne has parliamentary descendants. The speaker of the US House of Representatives sits on the most impressive chair in the chamber, although his chair pales by comparison with that of the speaker of the British House of Commons, which is a canopy-topped, 12-and-a-half-foot-tall Gothic Revival chair that resembles a small building. The American president does not occupy a throne; he sits behind a desk. In the past, the presidential desk chair was passed down from incumbent to incumbent: William Howard Taft and Woodrow Wilson both sat on Theodore Roosevelt’s stylish mahogany-and-rattan swivel desk chair; and Franklin Delano Roosevelt made do with Herbert Hoover’s Colonial-style swivel chair, a cozy seat upholstered in a patterned material. It was Truman, the Midwestern storekeeper, who first used a large leather office chair, and subsequent presidents have followed his lead. A 2009 official White House photograph shows the newly elected President Obama in the Oval Office trying out different desk chairs, while his predecessor’s chair, a contemporary design in black leather with a tall headrest, stands forlornly to the side. Obama settled on a traditional—vaguely Georgian—executive chair with dark brown leather upholstery and curved mahogany arms. John F. Kennedy used an executive chair with a footstool, but the most memorable chair in the room was his rocking chair. It became such a potent symbol that when his successor, Lyndon Johnson, redecorated the Oval Office he acquired an identical rocker and pointedly sat on it during meetings. An Aeron Chair would not suit the Oval Office, a reminder that furniture is generally a handmaiden of decor. When Frank Furness built the main library of the University of Pennsylvania in 1891, he furnished the main reading room with Thonet No. 18 café chairs, whose utilitarian character suited his architecture. (A hundred years later, when Robert Venturi Hon’80 and Denise Scott Brown GCP’60 GAr’65 Hon’94 restored the library, they chose red sack-back Windsor chairs—more comfortable but still in the spirit of this functionalist yet exuberant building.) In 1928, when the Swedish architect Erik Gunnar Asplund built the Stockholm Public Library, an example of Nordic classicism, he designed reading chairs with broad curved backs that recall klismoi. When Rem Koolhaas and Joshua Prince-Ramus furnished the Seattle Central Library, they chose seating to suit their building. Designed by the Belgian designer Maarten Van Severen, the desk chairs have plain metal legs and a molded black polyurethane seat and back that are pliable and slightly cushiony—industrial chic. Chairs mirror taste as well as style. In the 1960s, for example, the papasan chair was all the rage. Introduced to the United States from Indonesia, this rattan easy chair consisted of a large bowl-shaped seat, three to four feet in diameter, fitted with a padded cushion. The seat was not attached to the base and could be rotated to be more or less reclined. Inexpensive and unconventional, the papasan was a favorite of college students. Today, there are so many used papasans for sale on the internet that one writer called them “the Stair Masters of furniture.” The beanbag chair was another 1960s fad. Unlike the papasan, which was a vernacular design, the beanbag was the work of three young Italian furniture designers. Called Sacco, the malleable pear-shaped bag filled with polystyrene pellets could accommodate a variety of postures, from upright to semi-reclined. Marketed as a nonpoltrona (nonchair), it was a graphic repudiation of mainstream taste. Beanbag chairs were especially good for listening to music, although getting up could be something of a struggle. We had a red Sacco in the late Sixties. I also owned a pair of bell-bottom pants and a Nehru jacket. Eventually, the pants and the jacket stayed in the back of the closet; as for the chair, it died—the pellets must have got compressed, for the bag no longer kept its shape. While beanbag chairs are still sold today—in an astonishing variety of shapes and materials and in alarmingly large sizes—they seem like a throwback to an earlier time, a reflection of a particular countercultural moment. Today, when I see a Sacco I think of Carnaby Street and Swinging London, just as a bergère, with its padded elbow rests and carved gilded legs, brings to mind Madame de Pompadour, and a sack-back Windsor chair conjures up the Founding Fathers. Different times, different chairs. Perhaps one reason that we create new kinds of chairs is because, in the words of the design critic Ralph Caplan, “a chair is not an artifact of service but an artifact of culture.” That is why the history of the chair is not evolutionary: a cabriole chair is not “better” than a klismos, any more than an Eames lounge chair is superior to a recliner. They are simply different—they convey different meanings, carry different cultural messages, suit different tastes. “A chair is the first thing you need when you don’t really need anything,” observed Caplan, “and is therefore a peculiarly compelling symbol of civilization.” The way we choose to sit, and what we choose to sit on, says a lot about us: our values, our tastes, the things we hold dear. Excerpted from Now I Sit Me Down: From Klismos to Plastic Chair: A Natural History by Witold Rybczynski. Copyright © 2016 by Witold Rybczynski. Reprinted by permission of Farrar, Straus and Giroux, LLC.